IVMF's Vanessa Marquette with Marine Corps veteran and Syracuse University student and football player Ben Brickman and his service dog Riley. Science, Technology, Engineering, and Mathematics (STEM) ventures are some of the most successful small businesses in America, and this trend is even greater among veteran-owned businesses. Despite this trend, there are significant barriers for veterans applying their STEM skills to start an enterprise or find a job. The Institute for Veterans and Military Families at Syracuse University (IVMF) is working hard to change all that. To date, IVMF says more than 100,000 have leveraged these programs, all provided at no cost to participants. Street Smarts VR is a tech company that participated in one of the many no-cost IVMF entrepreneurship programs designed to arm veteran-owned businesses with access to the training, networking and financial relationships they need to succeed no matter where they are in their business lifecycle. Founder and Marine Corps veteran Oliver Noteware applied his experience in virtual reality and military training and created Street Smarts VR. Street Smarts VR provides distributed, immersive VR training to police departments to improve officer judgement. Despite this trend for veteran-companies, there are a number of obstacles they face to start a STEM-focused business. Lack of access to capital tops the list, as over 80,000 veterans closed their business as a result of inadequate cash flow, sales or personal loans/credits. Warren Foster, owner of Science Playhouse, a STEM education company. Warren Foster is an alumnus of the IVMF Entrepreneur Bootcamp for Veterans program, an intensive training held at 10 universities around the country providing experiential learning for veteran business owners in business finance, marketing, and strategic planning. Kathleen Ford, CEO of SC DataCom, supervising the testing of security infrastructure install for a client. Another example is scDataCom, which provides hi-tech security and communications solutions. “We started with a great understanding of the tech and our customer,” added scDataCom founder and military veteran, Kathleen Ford. “Now our biggest challenge is to find tech talent to keep up with demand, and we are looking to hire veterans.” Ford is also an EBV graduate whose business revenue has grown by 400% in the last three years. According to the non-profit Code.org, the United States will add about one million STEM jobs by 2020. There were 607,708 open computing jobs in the country last year, but only 42,969 students with STEM expertise entered into the workforce. To meet this demand many employers are looking to military veteran talent. Veterans are nearly 1.5 times more likely to be in STEM jobs than non-veterans. They come to jobs “STEM pre-qualified” through their military training. There’s even a positive trend of women veterans into STEM from 2010 to 2014 time period. Women veterans are nearly twice as likely to be in STEM occupations compared to female nonveterans. A traditional military market like San Diego, for example, has 100 cybersecurity firms looking to fill estimated 4,200 unfilled jobs. But military veterans face significant barriers to STEM jobs like this. The greatest barrier is the lack of a pipeline matching veterans’ skill-sets to degrees and jobs. 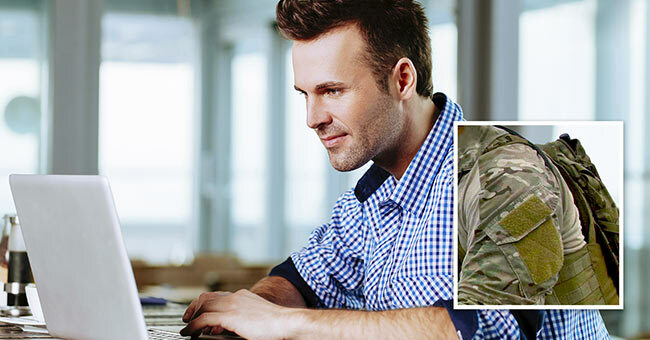 Military.com’s Military Skills Translator + Personality Assessment tool can be a good starting point to identify key skills that can help veterans zero in on the right career path. The Institute for Veterans and Military Families (IVMF) is the first interdisciplinary national institute in higher education focused on the social, economic, education, and policy issues impacting veterans and their families. Through its professional staff and experts, the IVMF delivers leading programs in career, vocational, and entrepreneurship education and training, while also conducting actionable research, policy analysis, and program evaluations. For more information, visit ivmf.syracuse.edu and follow the IVMF on Facebook, Twitter and Instagram.